The past years, the Dragon1 EA practice has shown that architecture products are used much better if the data quality is high and contains certain structures, relationships and information/metadata. The Dragon1 Architecture Checker looks into your data to find these structures, relationships and information/metadata and supports you to improve your data. 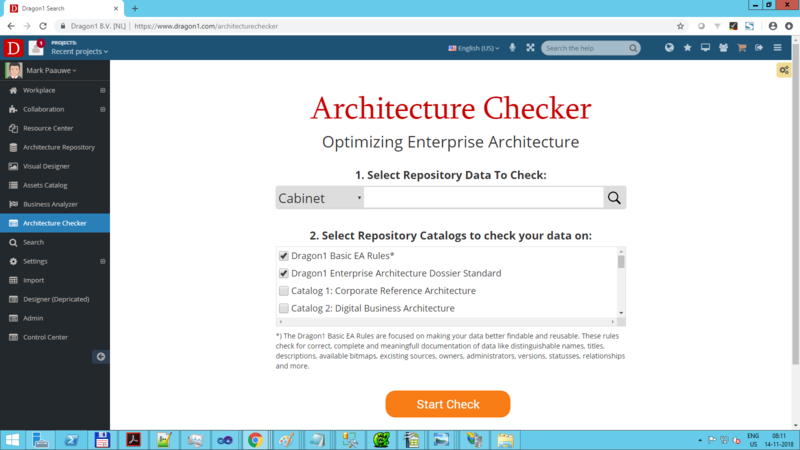 The architecture checker supports you in optimizing Enterprise Architecture. Companies that work with Enterprise Architecture often have many projects that can make use of many architecture products to create designs and realize solutions or build systems. The challenge for architects, managers and CIOs is how to know that these designs and build solutions actually are compliant to the architecture. Or how to know that the architecture products are compliant to standards, rules, policies and reference architectures. The Dragon1 Architecture Checker helps to see if a design or an architecture is compliant to this information. As a user of the platform, you can upload or import your own catalogs (i.e. lists of) principles, rules, standards and policies or make use of the Out-of-the-Box catalogs on Dragon1. Architecture is much more optimal when the architecture contains principles (the core building block of architecture) and if these principles are linked to requirements and strategic goals and objectives and when the principles are linked to projects, designs and deliverables. Dragon1 Architecture Checker tracks and traces for you if these relationships are there in the data. Also basic data administration completeness is checked: unique ID, reference IDs, Naming convention, Single Source, Descriptions, Images, Owners, etc... The better and more complete your data is administered, the more usable the architecture products are for stakeholders and projects. The Dragon1 Architecture Checker focusses on Architecture Principles, as they are the core building block. Any architecture product that does not contain or relate to architecture principles, is essentially missing its core. The checker looks for the presence of principles in data, the structure, syntax and models or patterns of the principles. By reporting on this, you get the opportunity to improve the internal and external quality of the architecture. And this just by clicking on one button. If architecture only contains principles names, but not has principles modeled as patterns, one cannot argue or see if the architecture or the design created are compliant to these principles. Just using the name of a principle in an architecture is not enough to have the architecture guide design that is actually using the principle. For instance, if the principle "Single Source of Truth" is used for client data, the architecture should model what types of elements are the sources and how many of these sources (exactly 1 in this case) are allowed for certain types of client data. The Dragon1 Architecture Checker looks for these kinds of structures, models and relationships. Dragon1 uses Artificial Intelligence techniques to help you prevent and detect fraud in business processes. Just upload or import your BPMN process models, your process logs and business principles. With this information put together, Dragon1 will scan and analyze your data and report with text and graphs how likely certain parts of your process are vulnerable to fraud. If certain process steps in the log are non-compliant to the process flow, Dragon1 can detect that and report it. Dragon1, for instance, will look for patterns like a change in behavior over time and suspicious behavior in your data. To use the Dragon1 Architecture Checker, you first need to create a trial account here.